To create my card, I started with a piece of blue patterned paper that I created last week with my Gelli Arts printing plate. I cut it to the size that I wanted, then I heat embossed the chevron design on the top and bottom with white embossing powder. 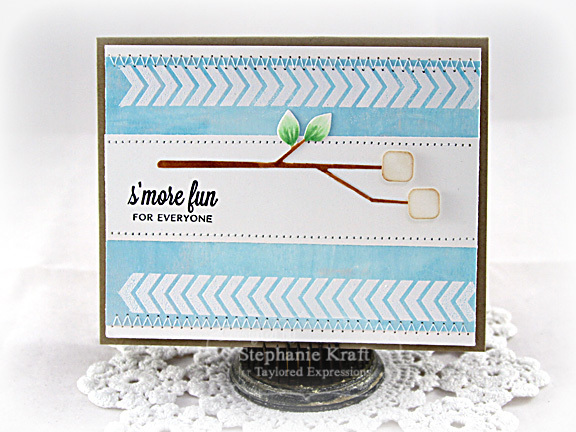 To create my s'more stick and marshmallows, I used the coordinating dies, Around the Campfire, which can be purchased separately from the SOTM. Remember, you only have until August 31 to become a Stamp of the Month subscriber and receive this darling stamp set! 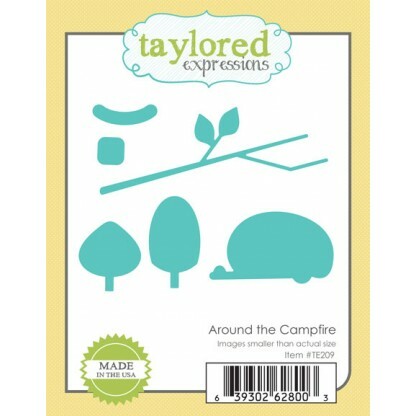 Accessories: Taylored Dies: Around the Campfire (TE), Markers (Copic), White embossing powder, Foam tape, Thread, Sewing machine. Super cute card Stephanie! Your lightly toasted marshmellows look scrumptious!